The Giambattista Vico foundation is a non-profit cultural organization created in 1999; the idea was promoted by, among others, Elena Croce, daughter of philosopher and historian, Benedetto Croce. The Foundation is dedicated to the life and work of the Neapolitan philosopher, Giambattista Vico (1668-1744). It has acquired the Palazzo (or Castle) De Vargas (image, below,left) in the small town of Vatolla, well south of Salerno in the area known as the Cilento. Vico spent nine years of his life there (1686-1695), tutoring the nephews of the lord of the manor, but primarily regaining his health in (from Vico's Autobiography) "a castle in Cilento, a beautiful place with perfect climate." He recalls that he often wandered over to the Franciscan monastery of S. Maria della Pietà to chat with the monks and use their fine library. Out in the gardens, some of the trees that Vico saw are still standing. 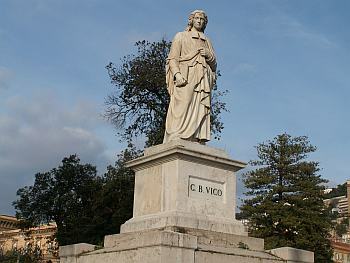 One of them, an ancient olive tree, is still called “Vico's tree.” He was in his early twenties and it was here in the gardens that he laid the framework for his grand life's work, Principles of a New Science of Nations. 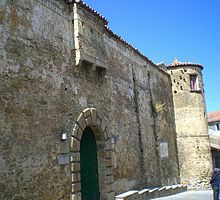 The premises of the castle (image, right) now hold an extensive library containing 15,000 volumes, including an important section on the history of the Cilento and Vallo di Diano, a Vico Museum, and an "ethno-anthropological museum of Mediterranean Life," displaying period tools, implements and equipment of various sorts. The castle, itself, goes back a thousand years. The premises are now within the boundaries of the Cilento and Vallo di Diano National Park, a protected UNESCO Heritage area. Since coming into the possession of the structure, the Vico Foundation has restored it extensively. The Giambattista Vico Foundation from its castle home in the Cilento now actively promotes seminars and meetings, provides scholarships, puts on theatrical productions and classical music concerts and is involved with both Italian and foreign universities. It recently opened a museum at nearby Paestum dedicated to “Paestum During the Grand Tour” (that is, the 18th and 19th centuries) that features a unique 150-piece collection of paintings and etchings of Paestum and a collection of ceramics from the archaeological site, itself. The Naples seat of the Vico foundation is under development in the historic center of Naples, at the intersection of via San Biagio dei Librai and via San Gregorio Armeno on the premises of the two adjacent churches of San Gennaro all'Olmo (elm) and San Biagio Maggiore (in the small space just to the left of #26 on this map). The two sites were, in fact, once a single house of worship going back to the time of the iconoclast religious wars among Orthodox communities in the east in the eighth century AD, at which time a large influx of religious refugees into the area caused the congregation to divide. They are tiny buildings that go almost unnoticed today, surrounded as they are by the very large Roman Catholic churches built nearby much later (including the Cathedral). In any event, the premises are about one block away from where Vico worked and lived in Naples. Both churches were abandoned for years and have recently been undergoing restoration by the Vico Foundation. The Foundation's goals (from their literature) are: “To safeguard nature and the environment, conduct scientific research, open new museums, promote culture and art, disseminate the philosophical ideas of Giambattista Vico, educate the young, and establish a library and publishing firm."